In a series of books published over the last fifteen years by the University of Iowa Press prominent literary men and women from the 19th century such as Louisa May Alcott, Edgar Allen Poe, Mark Twain and Walt Whitman have been remembered by those that knew them best; not modern historians but their contemporaries who knew them as they lived. 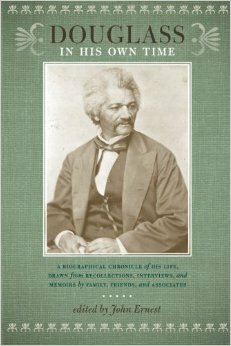 Joining rank in the collection is Douglass in His Own Time: A Biographical Chronicle of His Life, Drawn from Recollections, Interviews, and Memoirs by Family, Friends, and Associates,” ably and succinctly compiled by John Ernest, Chair of the English Department at the University of Delaware. Douglass in His Own Time is a welcome and timely addition to the truly limited scholarship on Douglass, poised to swell as we approach the bicentennial of his birth in 2018. The book includes an introduction, 13 photos and prints (not cited with the most exacting detail or captions), a chronology, 43 unique entries and an index. The recollections span the entirety of Douglass’s life from his early years as a slave at Wye House to his toil as a rising star and agent on the anti-slavery circuit to his controversial second marriage and travels abroad to his waning years as a commencement speaker. Well-known individuals appear from William Wells Brown to Paul Laurence Dunbar to Elizabeth Cady Stanton alongside lesser-known reformists, journalists and educators such as “Grace Greenwood,” Cordelia Ray, James McCune Smith, and Kelly Miller. While expansive in its selection it is in no way inclusive of all sources nor does it pledge to be. Absent are reminiscences from any members of Douglass’s family as well as two women, Ida Wells and Mary Church Terrell (as well as her husband Robert H. Terrell), whose activism influenced the direction of 20th century American life. Any limitations aside, the book promises to be enjoyed by both general Douglassonian and specialists. 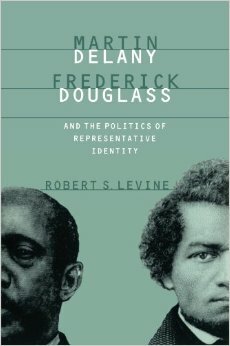 For those building their Douglass-related library, your collection is not complete unless you have Douglass in His Own Time. Robert Levine, Professor of English at the University of Maryland, will give a talk drawing from his forthcoming book, Frederick Douglass’s Lives (Harvard University Press, 2016). The impressively prolific Bob Levine has been an influential force in American and African American literature for thirty years, and more recently has contributed important new work to the burgeoning field of hemispheric American literature. His prominent publications, such as 2008’s Dislocating Race and Nation, 1997’s Martin Delany, Frederick Douglass, and the Politics of Representative Identity, and 1989’s Conspiracy and Romance: Studies in Brockden Brown, Cooper, Hawthorne, and Melville, cover an array of themes critical to an understanding of 19th-century American literature. In addition, Levine’s numerous scholarly editions of Melville, Hawthorne, Martin Delany, William Wells Brown, and Harriet Beecher Stowe have helped restore lesser known works to wider audiences. Levine is a highly visible figure in literary circles, sitting on the editorial boards of American Literary History, Leviathan: A Journal of Melville Studies, and J19: The Journal of Nineteenth-Century Americanists, serving as General Editor of The Norton Anthology of American Literature, and as editor of numerous volumes of collected criticism, including Hemispheric American Studies (co-edited with Caroline Levander) and The New Cambridge Companion to Herman Melville. His recent awards include a 2012-13 National Endowment for the Humanities Senior Fellowship and a 2013-14 John Simon Guggenheim Fellowship. He was recently named a Faculty Fellow at Texas A&M’s Institute for Advanced Study. Each year the Frederick Douglass Memorial and Historical Association (“FDMHA”) sponsors an Essay Scholarship Contest and invites senior high school contestants in Washington, DC or in Maryland or Virginia within a 50 mile radius of Washington, DC to consider the relevance of Mr. Douglass’ legacy by writing an essay on a carefully researched subject that incorporates the writings and the life history of Mr. Douglass. The winner of the competitive annual contest is awarded a $3,000 prize. A second place winner receives $2,000 and a third place winner receives $1,000. The FDMHA Essay Scholarship Contest offers a meaningful opportunity for contestants to develop and enhance research, writing, and critical thinking skills while they deepen their understanding and appreciation of Mr. Douglass. The contestant must choose only one political party to whom Mr. Douglass would deliver an address that demonstrates an understanding of the life and contributions of Mr. Douglass. The contest is open to senior high school students attending public schools in Washington DC, or in the State of Maryland or the Commonwealth of Virginia, within a 50 mile radius of the District of Columbia. The students must be accepted into post-secondary studies prior to receiving any monies. Scholarship funds will be sent directly to the school that the student is enrolled in the fall of 2015 or the spring semester of 2016. The contest deadline is Wednesday, March 18, 2015. Click here for additional information, including the full list of requirements. Any questions, please contact Juanita Ferguson, (202) 544-6474. To learn more about The Frederick Douglass Memorial and Historical Association, enacted June 6, 1900 by the United States Congress to preserve for posterity the memory of the life and character of Frederick Douglass, visit http://frederickdouglassmha.org/ or email: info@frederickdouglassmha.org.